Arrive Copenhagen (Including Own Travel Students). Transfer to accommodation. * Balance of day free to relax. Copenhagen, the capital city of Denmark, was originally a Viking fishing village in the 10th century. Cosmopolitan and historic, the city is famous for its historical center, Tivoli Gardens, Nyhavn Canal and Royal Quarter, and Hans Christian Andersen. Situated on the coastal island of Zealand and Amager, it is linked to Malmö, Sweden by bridge. Morning orientation with AIFS staff. Afternoon sightseeing tour of Copenhagen to iconic places in the city, followed by a traditional welcome meal. Morning class. Afternoon excursion to the National Museum of Denmark. This is the largest museum in Denmark, focusing on both Danish and foreign culture and history and featuring an extensive exhibition on the Viking Age. Day trip to Roskilde Viking Ship Museum. This museum of ancient and medieval maritime culture includes five Viking ships. Free day. Enjoy summer solstice festival celebrations on Sant Hans Aften, which include bonfires and late evening gatherings. Day trip to Ladby Viking Museum and Telleborg Museum of the Viking Age Ladby Viking Museum, a major ship burial sitediscovered in 1935 is the only one of its kind in Denmark. 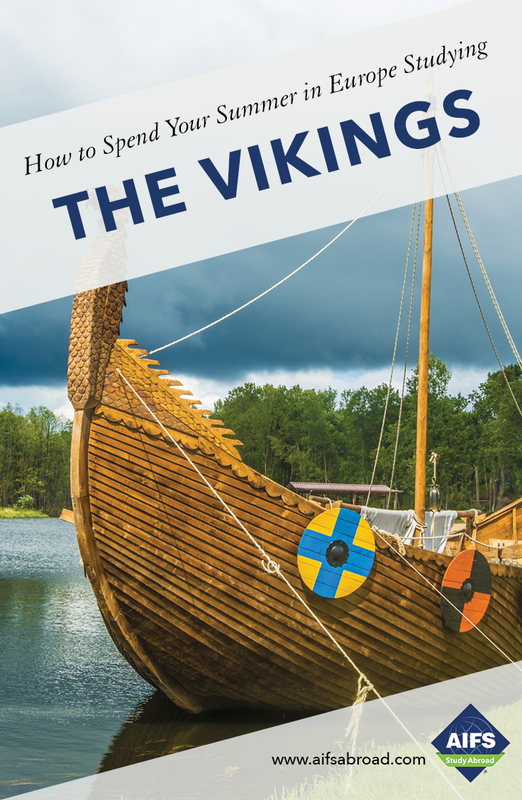 Believed to be the burial site of a prince or chieftain, it offers an engaging overview into the history of the Vikings. Telleborg, a circular fort from 900AD features displays on Viking life and culture. Day Excursion to Jelling Mounds and Runic Stones and Church. The Jelling burial mounds and one of the runic stone are excellent examples of pagan Nordic culture, while the other runic store and the church illustrate Christianization of the Danish people towards the middle of the 10th century. Morning departure to Malmö by train. Free afternoon to settle in and explore the capital of Skane, Sweden’s third largest city. Day trip to Foteviken Museum. This archaeological open-air museum conveys how life might have been in the Viking Ages. Experience the “Market Village” with activities, Viking games, crafts, and reenactments. Morning departure to Stockholm by train. Settle into the accommodation, followed by a historical center walking tour. Stockholm, Sweden’s beautiful and elegant capital city, is made up of more than 14 islands and 50 bridges. It is famous for its old town, Gamla Stan, and home to the Nobel Museum. Day trip to the UNESCO World Heritage site, the Viking town of Birka. Located on the island of Björkö, Birka was once the most elaborate trading network of Viking Scandinavia. Morning class. Afternoon visit to Vasamuseum, which displays the only almost fully intact 17th century ship salvaged. Day trip to Uppsala. Visit Gamla Uppsala, explore its royal mounds, ruins and burial sites and accompanying museum. Morning class. Afternoon visit to the Swedish History Museum and its Viking Age exhibition. Morning departure to Oslo. Settle into hotel and free afternoon. Visits to the Historical Museum and the Viking Ship Museum. Morning class and final exam. Farewell traditional meal. AIFS reserves the right to modify the itinerary. Dates are subject to change.